Professional Powerful motor for all day Blending. 1.5 liters Polycarbonate Twin Lid Jar with an Aluminum base for stability. Optional 2.5 liters Polycarbonate Twin Lid Jar also available. 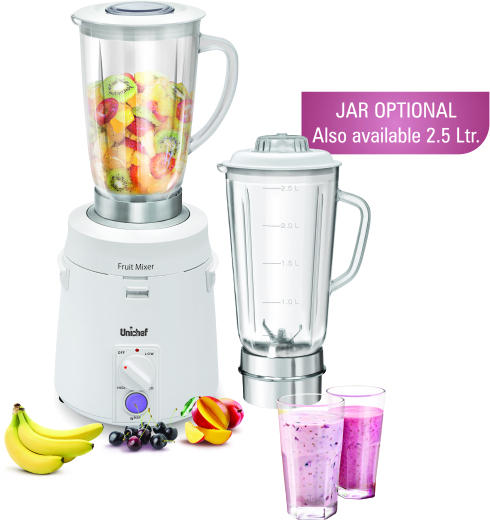 Fruit Mixer has a specially designed polycarbonate container jar which is virtually unbreakable and lets you see inside and comes along with a heavy aluminum base for stability during long blending jobs. Its 3 speeds options and crushing R.P.M ensures perfect consistency as it works as a money spinner for Juice Bars, Coffee Shops, Restaurants, Spas, & Health Clubs.